We’re about to get started on the good stuff… actually formatting your Word document. I sure hope you’re as I excited as I am? I’m always eager before I start a new book formatting project. 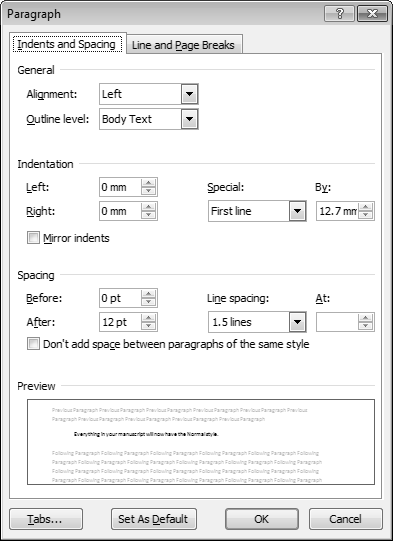 In this post we’re going to look at the fundamentals of formatting your Word file. If you have formatted your book for the Kindle, you will have very little to do to get that file ready for Smashwords. If you already have your Kindle Word file, you can use the same file and make the small changes to get it ready for Smashwords. If you haven’t formatted your file for the Kindle yet, no problem – all the details are available in the following 4 posts. Your Word file size must be less than 5Mb. Open your existing Word file or create a new Word document. Turn on Word’s Show/Hide option. 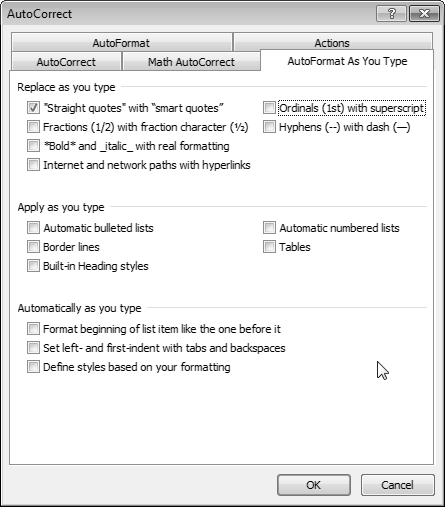 Turn off Word’s AutoCorrect: AutoFormat As You Type and AutoFormat features: The reason we turn off these AutoFormatting options is because Word will cheerfully and automatically mess things up again as you make the corrections. Word 2007: Click the round Office Button (top left corner), then click the Word Options button. Click the File tab, then click the Options button. Click the Proofing option, then click the Autocorrect Options button. Click the Proofing option on the left, then click the AutoCorrect Options button. Click the AutoFormat As You Type tab (see below). Uncheck all the check boxes on this window. Remember, formatting your book for Smashwords is like old fashioned typewriting, and you need to strip away all special styles from your manuscript, if you have these in your book. If you’re starting to write your book or have a plain manuscript, you won’t need to worry about removing styles. If you already have your book written (and formatted) in Word, pay special attention to the following. Indentations (keep in mind that the Kindle automatically indents the first line of a paragraph – this is a default setting in Kindle). You can select your whole manuscript and change everything to the Normal style. 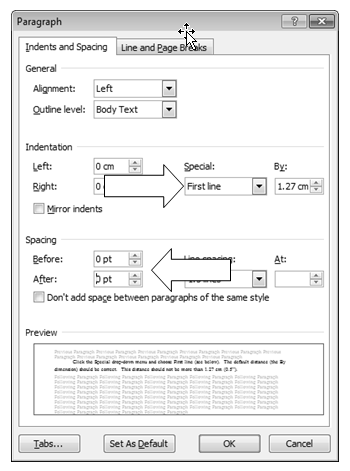 Then you will need to go through your manuscript again, and add the Heading styles, italics, bold, etc. We’re going to use this method in this post. Open your Word file (remember it must be the .doc version). Make sure Track Changes in Word is turned off. Place your pointer in the left hand margin (outside of the text). See the pointer arrow below. Hold down Ctrl and click your left mouse button. Everything in your manuscript will now be selected. Click the Normal style in the Styles toolbar. Everything in your manuscript will now have the Normal style. Looks really plain and boring, hey? The method here is for the block paragraph style, and not the first line indent style (see optional style below). By default Kindle indents the first line of each paragraph; for this reason I don’t suggest using this paragraph style. Instead rather use the block paragraph style. NOTE: Do not follow this step if you already created a proper first line indent as explained below. Select a paragraph (if you’re not converting an already written manuscript, type any text and select it). Click the Paragraph style drop-down arrow. 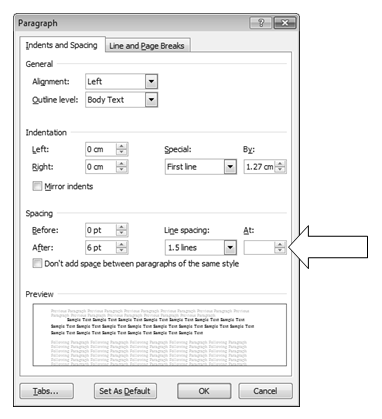 In the Spacing section, change the After distance to 6 pt (this will create a space of 6 points after each paragraph). I generally don’t recommend less than 4pt or more than 12pt for this space. IMPORTANT: NEVER, NEVER allow any entry into the “At:” field (see above), otherwise your book may become unreadable in the HTML reader and in the ePub format. If this error slips through the Smashwords review process, retailers will remove your book when their customers complain. To determine if this error might be affecting your document, right-click on any paragraph, choose Paragraph, and then you’ll see the window below. This error is most commonly caused when you create your manuscript in a program other than Microsoft Word, and then the non-Word program fails to convert the file into a proper Word .doc. You can set the line spacing to 1.5, although Single line spacing is acceptable. NOTE: If you’re not going to submit your book to Kindle through Smashwords, but directly through KDP, you should not use the first line indent paragraph style. Kindle tip: The Amazon Kindle and its associated apps (Kindle for PC, Kindle for Mac) automatically insert a preceding first line indent, even on block paragraphs. If you want to enforce the block method across all formats and devices, including the Kindle, define a first line indent under “Special” above of 0.01”. The indent will be imperceptible to most eyes, and it should prevent Kindle and its apps from inserting the first line indent where you don’t want it. Click the Special drop-down menu and choose First line (see below). The default distance (the By dimension) should be correct. This distance should not be more than 1.27 cm (0.5”). Leave the Before and After Spacing at 0. Your font color should be set to Automatic. If your font color is set to Black, change it to Automatic. Some e-reading devices allow the reader to set their device to night mode, which will display your book’s test as reverse type if it’s set to Black. If you have a poetry book, cookbook, or learning materials, please refer to the Smashwords Style Guide for the specific formatting for these types of books. In the next post we look start with the actual formatting of your ebook. If you have any questions about anything in this post, please let me know in the comments.